The 2013 World Superbike and World Supersport Championships got underway proper earlier today at Phillip Island, Australia. 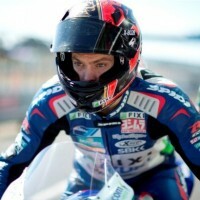 Former BSB Champion Leon Camier maintained his position as the man to beat in World Superbikes so far this year, taking his FIXI Crescent Suzuki to the top spot. A rejuvenated Leon Haslam (who has switched from BMW to the Pata Honda team) was only a fraction behind in 2nd while Italian Michel Fabrizio looked impressive aboard his Red Devils Roma Aprilia in 3rd. Eugene Laverty was 4th ahead of BMW’s Marco Melandri while former champ Carlos Checa (who had missed last week’s private test due to illness) slotted the all new Alstare Ducati Panigale into 6th. Of the other Brits competing, Johnny Rea had a small crash but ended 9th, Tom Sykes was 10th and Chaz Davies was 11th. In Supersport it was Brit Sam Lowes who headed the field aboard his Yakhnich Motorsports Yamaha. The former Honda rider looking very much at home in his new red and green livery. Reigning champion Kenan Sofuoglu was 2nd while Lowes’ team-mate Vladimir Ivanov made it a Yamaha 1-3 in 3rd. Former 125cc World Champion Gabor Talmacsi was 4th ahead of Pata Honda’s wonderkid Michael Van Der Mark (last year’s Stock 600cc champion) in 5th. Frenchman Fabien Foret finished the day in 6th. MV Agusta showed potential with Roberto Rolfo in 9th while Christian Iddon impressed in 13th overall. Kev Coghlan finished the opening day of testing in 17th while Jack Kennedy (runner up in last year’s British Supersport championship) adjusted to world championship life in 26th. Of the MHP supported riders, Italian Alex Baldolini was 12th aboard his Lorini Honda (impressive considering he had only had 2 hours of track time prior to heading to Australia). Balazs Nemeth was 24th, while WSS debutants Matt Davies and Alex Schacht were 32nd and 34th respectively. The final day of testing takes place tomorrow.